As baby boomers enter their 60s and 70s, they may wonder if their lives still matter in an age of Social Security. They wonder how to deal with the bitterness that life frequently doles out. Pam Mark Hall in 2017. No musician embodies that question as much as Pam Mark Hall, who was a rising music star until a divorce. Christian fans deserted her, sending her into poverty and causing her to give up performing for about 30 years. Several years ago, she returned to her California roots and released a seventh music album long past the age when most singers dare to do so. Called “Mangle the Tango,” it’s an encouragement to the over-50 crowd that “it’s better to fall than never dance at all.” She was 65 when it was released. 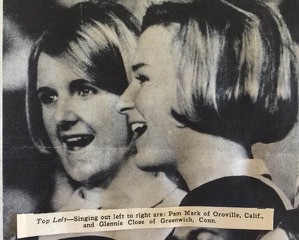 Pam Mark Hall (left) singing with Glenn Close (right) in 1967. A multi-talented gospel artist, Hall was the new fresh female face of contemporary Christian music (CCM) in the 1970s and 80s. At only 15, she was selected to sing with “Up With People,” a famous touring singing group where one of her cohorts was a then-unknown teenager named Glenn Close. Her career then took her to Portland, Ore., then to Nashville where she composed and sang with the best-known musicians in the country. In her early 20s, Hall was mentored by John Fischer, the contemporary Christian music (CCM) pioneer who founded the Discovery Art Guild at Peninsula Bible Church in Palo Alto. Her 1975 album “Flying” was released on Aslan Records, the guild’s music label, and was one of the first records to be reviewed by Campus Life magazine. Hall was one of a handful of young evangelical Christian female performers making a name for themselves. Evie Tornquist, Jamie Owens, Debby Boone and Nancy Honeytree were some of the other popular musicians of the era. That was also the same year that a 17-year-old named Amy Grant would come out with her first album. Grant would turn out to be the game changer for CCM; redefining it from more folk treatment by artists like Hall to a flashier pop music sound. Hall changed her style to incorporate more jazz and rock along with folks for her 1980 album “Never Fades Away.” When two of Amy Grant’s managers approached her about being part of Reunion Records, their new record label, she agreed to move to Nashville in 1981 along with her husband and four-week-old daughter Emily. Hall’s career soared as she released more albums, sang background vocals for “Age to Age,” one of Grant’s gold records (“gold” signifying more than 500,000 in sales) in 1982 and produced a popular album of lullabies (“Good Night, Sleep Tight”) in 1983 that is her best-selling album to this day. Behind the scenes, her marriage was crumbling amid the conflict between her public role as an independent singer and record producer and her domestic role as a woman forced to be submissive to her husband. In an era when Marabel Morgan’s “The Total Woman” was a best seller, female submission was part of the evangelical Christian framework for marriages. In 1987, Hall filed for divorce, citing infidelity and misogyny as reasons. The CCM world was unforgiving. Reunion Records dropped her (“They couched it in, ‘We don’t think God wants us to do any more records with you,’ ’’ she said), which deprived her of a label, the must-have platform for any Nashville-based artist. Within a year, Hall went from singing at concerts in front of thousands to being a single mom cleaning houses and hanging wallpaper. Like many musicians, she hadn’t put much thought into personal finances. “Frankly, I thought I’d be doing this the rest of my life or until Jesus comes,” she says. “And back then, we were looking for Jesus to come again. So we weren’t thinking about getting through retirement. We were thinking of saving the world. Many of her church friends abandoned her. Stunned, Hall sought out others who cared. Don’t you be an angry woman, angry woman. Give up all your rights, even when he does wrong. But don’t cha be an angry woman, angry woman. She got some gigs writing jingles for some top food brands until a Screen Actor’s Guild strike ended that. Then she was a personal assistant to singer Rosanne Cash. She put out one last album, “Paler Shade,” in 1993, but its label went out of business. She went to work for the Salvation Army earning $5 an hour and worked her way up to doing public relations. She then took a job with an advertising firm in Nashville, which paid the bills until the 2008 recession. Back on the street in 2009 looking for a job, she found her advertising know-how was out-of-date. She got into life insurance but quickly tired of dunning her friends for business. Eventually, she could no longer pay the mortgage on her home. Meanwhile, her 84-year-old mother, in Oroville, Calif., needed support. Hall’s daughter, Emily, had moved elsewhere and the musician decided it was time to leave town. Putting her belongings in storage, she moved back home to Oroville, Calif., living with her parents for a few months until her stepfather asked her to leave, saying she needed to get a job. She lived with an Anglican priest and his family for another year, then with various friends. Once she hit 65, she started getting Social Security and bought herself a mobile home. Meanwhile, Emily had started a GoFundMe campaign to raise funds for Hall to move her household goods from Nashville to Oroville. Friends raised $7,050 to help her move her Steinway piano – and other belongings - to California in mid-2016. Once that arrived, the singer began to create anew. By this time, she had found part-time work with insurance brokerage firms that hire her out as an employee benefits enrollment consultant with various businesses. During open enrollment periods, she helps workers figure out their benefits. Most of the people she meets, ranging from truckers to police officers, struggle to make ends meet. Once she turned 65 in November 2016, she chopped off her long hair and decided she had at least one more album in her. She chose “Mangle the Tango” for the title song. “How many times have you thought of something you’d love to learn or do only to be thwarted by that internal voice that warns you are too old, too out of date, you’ve had your turn, you aren’t that smart, you aren’t pretty enough, you’re too fat or out of shape, people will laugh at you, your family thinks you are weird and a loser?’’ she asked in the program notes. Pam Mark Hall singing in her studio. Along with lush color acrylics of women’s faces, there’s an eclectic play list that includes a song based on the best-selling book “The Shack.” There’s also a tribute to Harriet Tubman, a composition about a summer spent on Martha’s Vineyard and a piece about Judgment Day. Old friends Noel Paul Stookey and Peter Yarrow of the 1960s music group “Peter, Paul and Mary” agreed to lend their voices. Canadian rocker Bruce Cockburn sang his classic “All the Diamonds in the World” on the album as a duet with her. Two Nashville friends: Jerry Chamberlain and T.J. Klay, played guitar and harmonica. Many other friends offered help. Since there was no famous record company backing her, she turned to GoFundMe to raise $26,000 to do the recording and oversee the mixing, mastering and manufacturing of the CDs. Supporters donated $29,310. She did a series of 12 concerts promoting the album up and down the West Coast – where her artistry fan base is concentrated - at secular venues or in friends’ homes and since then has done a series of benefit concerts for fire victims in the Sonoma area. Her anger and hurt toward how many Christians treated her back in the 1980s has subsided to where she’s open to singing in progressive churches that never held her divorce against her. Now 67, she is philosophical about the disappointment many baby boomers like herself feel when life has not turned out the way they’d dreamed. “As a generation, we are at a spot where we have such high expectations of our lives and pressured to make something happen,” she said. “We spend our lives driven to accomplish things. She still has many songs that have not been released commercially. The author wishes to credit a 2016 research paper on Pam Mark Hall by Tim Dillinger for some of the material in this article.